Spinn Reviews: Is It Worth Placing a Pre-Order for This Coffee Brewer? Spinn is an app-connected coffee brewer that uses a patented centrifugal brewing chamber to deliver a perfect cup of coffee every time, regardless of your preferences. 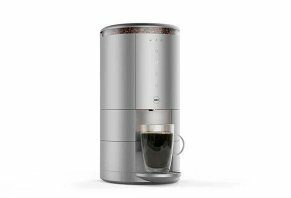 Spinn Review: Is It Worth Placing a Pre-Order for This Coffee Brewer? Using patented centrifugal brewing technology to grind fresh beans at varying speeds, along with app and Wi-Fi connectivity and exceptional water filtration, the Spinn coffee maker promises to help you unlock the potential inside every last bean. This way, whether you’re interested in Espresso, Lungo, or Americano, or a single serving or an entire carafe, their website advertises it “guarantees that your favorite roast is transformed into the perfect cup of coffee every time,” without waste, mess, or fuss. In addition to processing each parameter of your coffee, the Spinn Original is also available in three different models (one of which boasts an extra large bean reservoir), while all models come with an intuitive touch display interface, Alexa integration, self-cleaning functionality, and a small footprint. Compared to the competition (more soon), the device’s built-in sensors automatically reorder the beans of your choice from Spinn’s digital marketplace (which they advertise as giving “consumers direct access to the craftsmen behind the beans”), and delivers them directly to your door. Over the course of the next few minutes, we’ll provide key information that can help you determine if Spinn’s features—and comparatively high price—will meet your needs and deliver value. How Does the Spinn Coffee Brewer Work? The Spin Original and Original Plus models measure 13.29" H x 8.24" W x 13.12" D, weigh in at 8 lbs, comes with a 40" power cord, and feature a reservoir that can hold up to 17.6 oz (500 g) of whole, fresh beans from any roasters of your choice. None of these models support coffee grounds. The Original Pro’s XL reservoir (35oz, or 1 kg) increases the height to 15.26” and the weight to 9 lbs, while also offering a longer 60” cord, a milk frother, and compatibility with a water supply line. Note: In either instance, the website points out that the reservoir lid is not airtight, and you shouldn’t keep beans in place for more than two weeks. All three models come with a simple, intuitive interface that allows you to select from a range of brewing styles, which you can also accomplish via the app (more in a moment). The beans in the reservoir feed into an FDA approved conical burr grinder made from hardened steel that’s fully automatic and powered by a DC motor. Currently available for preorder, Spinn is an app-connected coffee brewer that uses freshly ground roasted beans to consistently create your perfect cup of coffee, all via a simple and intuitive interface. Credit: Spinn, Inc. The subsequent grounds are fed into Spinn’s patented centrifugal brewing chamber, where they meet with hot water between 203°F and 206.6°F, which has passed through nanofiltration technology to remove fluoride and chloride. Once mixed and spun at variable speeds between 500 RPM and 6,000 RPM, the company advertises the process forces all of the water to pass completely through the coffee grounds, leaving behind a clean, dry chamber that’s ready to prepare your next beverage. The Spinn brewer features several different sensors, including one that measures bean levels inside the reservoir and alerts you via the touch display and the app once it detects you’re running low. The website emphasizes that even if you do run out, this won’t damage the machine. Another sensor in the drip tray measures its status and alerts you when it’s full or needs cleaning. Similarly, the reservoir will only need to be cleaned periodically using a dry cloth to remove any built-up oils, while it's much of the same for the grinder. Spinn recommends using their grain and cereal-based Cleaning Pellets to accomplish this, while customers can purchase descaling pills directly from the company as well. 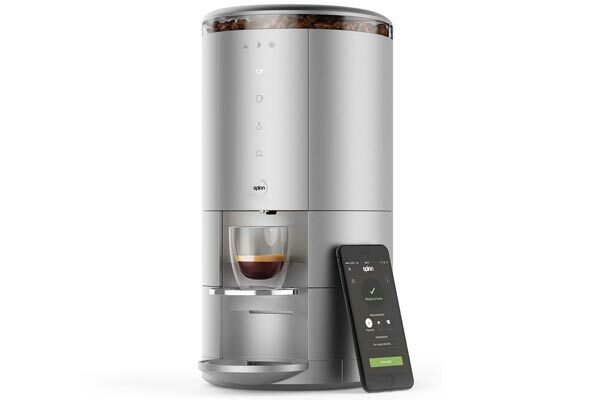 The Spinn coffee maker connects to iOS and Android smartphones via Wi-Fi, and is also integrated with Amazon’s Alexa, giving you control over all seven brewing parameters by voice command, via a few taps of your finger on the app, or on the device itself. It will then save your preferences for future use. The Spinn app also allows you to brew a fresh cup of coffee at specific times (such as when you wake up) and provides access to the machine’s status as it runs through its pre-set brewing sequence. You can even try out your own variables for a fully custom experience. As mentioned earlier, you can program the app to automatically order fresh beans when the brewer’s sensors detect you’re running low, which will pull from your pre-selected list of coffee roasters. Spinn also offers the unique ability to follow the roaster’s preferences during the brewing sequence or to control your own settings and share them with friends. You can also find recipes and other knowledgeable tips and tricks via their online community consisting of forums and customer reviews. How Much Does Spinn Cost? According to their website, the “first machines are estimated to start shipping at the end of the first quarter of 2018. We are then ramping up production for the following batches throughout the year. We will keep all buyers up to date on the development and manufacturing progress.” We’ll come back to this statement in the next section. They point out that all Spinn Original orders come with a batch number and estimated delivery date, which you can access under your Account Settings. Once machines start shipping, the carafe will be available for purchase at an estimated price of $49.00. Fresh coffee beans in their market ranged from $7.99 to $48.95 for between 8 oz and 16 oz at the time of our research. They appeared to feature an extensive selection, which could be filtered by roast (light, medium, dark, etc. ), flavor hints (floral, chocolate, citrus, berries, etc. ), organic or single origin, country of origin, relevance, newest releases, recommended by the company, and price. Note: After purchasing your brewer, the company will send you a code for credits redeemable in their marketplace, which can be used to buy beans. Spinn’s Primo program ($5 per month or $50 per year) provides members with early access to “new roasts and exclusive collaborations,” along with the ability to earn rewards and receive exclusive gifts. Customers can cancel their preorders at any time, while all shipped orders come with a 45-day no questions asked money back guarantee and a six-month warranty against manufacturer’s defects. You’ll need to send an email to support@spinn.com. What Are Customers Saying in Their Spinn Coffee Reviews? Michael Wolf over at The Spoon placed a preorder for the Spinn brewer in 2016. And as of May 2018, he was starting to worry that—other than a handful of beta testers, which some commenters speculated were friends and family of company employees (versus actual backers)—no one had received a device. In fact, no one had “heard from a beta tester, seen pictures, or anything.” This is despite the fact that their website advertised “4th Batch Sold Out, 5th Batch Ships End of 2018” at the time of our research. He noted that the company has been reasonably good about communicating what’s happening since missing their original September 2017 shipping date, although he (and many commenters) felt that the status updates were becoming increasingly vague. The company also offered him a refund. Some respondents in The Spoon article claimed (one with screenshots) that moderators weren’t posting many questions—or any remotely negative feedback—on the company’s Facebook page. The company continues to advertise heavily on social media. Outside of these, we encountered 16 user reviews related to Spinn’s Android app on Google Play, who gave it an average rating of about 3.8 stars. Only four users left feedback, all of which referenced no functionality—which might make sense, considering the device has yet to ship. Are There Other App-Connected Coffee Brewers Like Spinn? While you’ll undoubtedly find plenty of third-party, app-connected coffee brewers from household names like Keurig, Nespresso, Breville, and Phillps (to name just a few), we didn’t find anything designed exactly like Spinn with the same set of features. Like Spinn, Orenda also features app connectivity (and even the ability to set brewing alarms), uses whole beans, implements digital sensors to optimize “water temperature, coffee-to-water ratio, brewing time, and the amount of coffee dissolved,” and uses only food safe materials for parts that come into contact with the coffee. Online, users gain access to roaster recipes as well. Are there any meaningful differences? Perhaps the biggest is that after each brew, Orenda users can rate their coffee on several different metrics (strength, bitterness, caffeine kick, texture) via the app. Then, its machine learning system will tailor future brewing sessions based on these indicated preferences. Another difference is that it features a flat burr grinder constructed from stainless steel, boasts a built-in metal filter (it can also use standard paper filters), and has a bit smaller overall footprint than Spinn at 5.5" W, 12.2" D, and 15.6" H.
On the other hand, Orenda doesn’t feature any of Spinn’s sensors (such as when beans are low or when the drip tray requires cleaning), and there’s also no refill subscription service. Finally, there’s the price. Spinn’s three different models range between $299 and $599, with a milk frother and XL bean reservoir available in the Pro model. Orenda splits the difference at a preorder price of $399, with just one model available and an expected shipping date (with a history of delays as well) of November 2018 for the current batch. Whether you’re talking about Spinn, Orenda, or any other project found on a site like Kickstarter or Indiegogo, it’s important to point out that you’re not purchasing a complete product. In fact, some projects might not have anything other than a paper sketch in place. Because of the infancy of many of these projects, we’ve found that delays are often the rule rather than the exception. In fact, in a worst-case scenario, the company could go belly-up and take your pledge with it (according to a 2015 survey, roughly 10% of projects fail altogether). Together, while $299+ is nothing to sneeze at, make sure that you can do without the money when backing a project like Spinn. Accept that you might not see the product at all, and even if you do, years could have passed from when you initially pledged or placed your order. In fact, it’s been more than five years since some of Spinn’s original backers pledged for their devices via Kickstarter, without anyone other than a handful of ‘beta testers’ (as stated by the company) having laid hands on one. Still, the company points out that you can pull your pledge at any time with no consequence, and you’ll have 45 days to request a refund once they eventually ship if you’re dissatisfied. Write a Review for Spinn!